It’s that time. We hope you’ve enjoyed your lease, as much as we’ve enjoyed working with you. Now that you’re near the end of your lease agreement, you’ll soon have a decision to make – consider a new model, extend your lease, or purchase your vehicle. Our dealership accepts and encourages your lease return here, regardless of where you purchased your vehicle.That’s why we’ve put together this information for you – to help guide you through our lease-end process. Basically, you’ll need to familiarize yourself with three things: your lease-end options, our vehicle condition guidelines, and how to conduct your own vehicle condition review (before the lease-end inspection). Our process is simple, clear and concise. 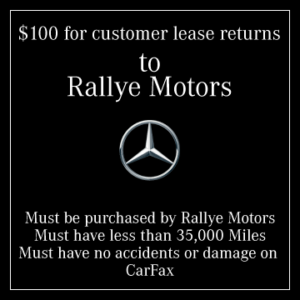 $100 for customer lease returns to our dealership! 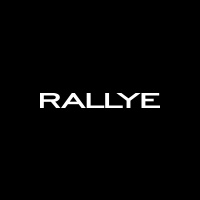 If you have any questions feel free to contact us at Rallye Motors. The First Class Finish® is our lease-end process that is specifically designed to be as simple and straightforward as possible. At Rallye Motors we help you cruise effortlessly through the lease return process. Rallye Motors will gladly help you pick out a new vehicle from our excellent selection of inventory. We’ll make it as easy as possible for your to turn in your lease and pick out your next Mercedes-Benz. Upon your vehcile return to Rallye Motors, you will receive $100 if your vehicle has less than 35,000 miles and no damage listed on CarFax. The first step of the lease return process is to schedule a vehicle pre-inspection. You will be contacted by an MBFS representative approximately 120 days before your contract maturity date to schedule an appointment with the independent third-party inspection company that conducts MBFS inspections. You will be able to choose the time and location that’s most convenient, including at home, at work, or at Rallye Motors. Contact our dealership at (516) 473-0793 to schedule a day and time to return your vehicle. You will be able to review your pre-inspection report online at www.AutoVINLIVE.com. Once you review the report, you can explore the option of repairing any excess wear and use items with Rallye Motors in advance of your expected vehicle return date.